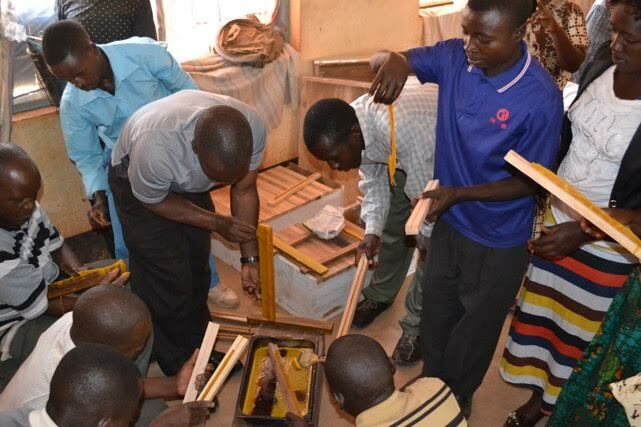 ​What a great time we had working with Father Esperius Hamenyande and his beekeeper trainees at Kasulu Technical School in Kasulu town, Kigoma Region. Kasulu is near the border of Burundi. 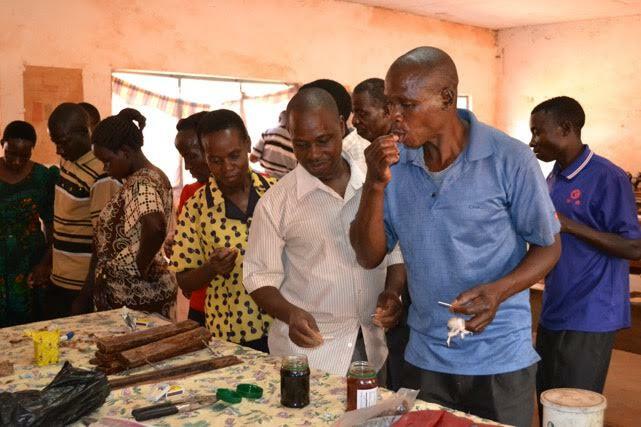 Over twenty people came from different regions in Tanzania to the course focusing on Theory and Practical aspects of African beekeeping. It took two days of hard driving to get to Kasulu but was very interesting as we had never been to that region of Tanzania. Most of the beekeeper trainees were from the Waha people group and were very proud of the beekeeping traditions in that area. 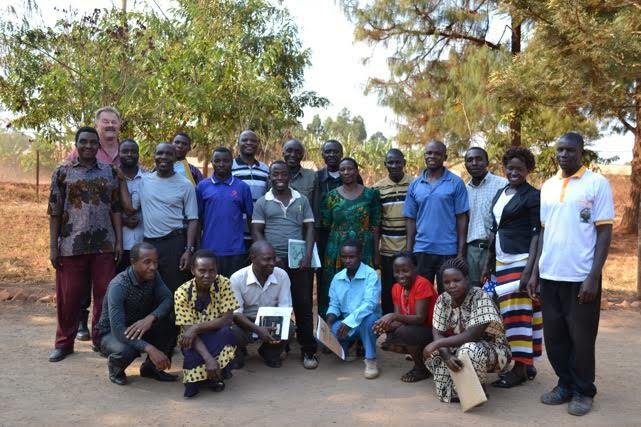 Kasulu, Tanzania beekeeper trainees pictured at Kasulu Technical School. The trainees had lots of good questions but were most concerned about how to get 100 percent occupancy in the beehives located in their apiaries. 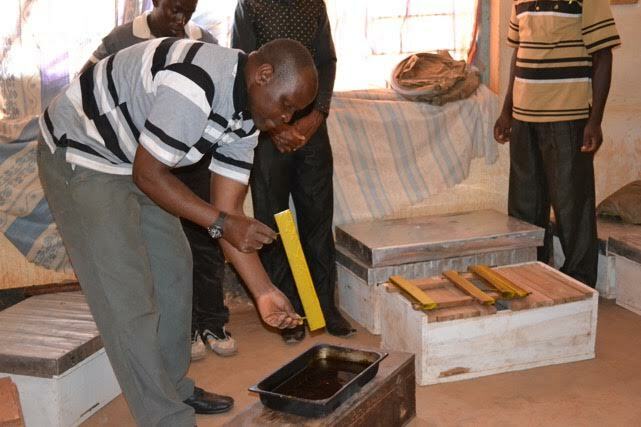 It is very demoralizing for a Tanzanian beekeeper to invest in hives and have a poor occupation rate. In Africa active beehives are best obtained through attracting swarms. During swarm season swarms of African bees tend to literally fly all different directions in their quest for a suitable location to occupy, draw out their comb and build up their numbers. An apiary that is located in a small cove in the forest is unlikely to get more than 2 to 4 occupations where it sits. The use of small 5-bar beehives, called catcher boxes, helps in the occupation process. (These small hives need to have bars that match the hives in your apiary. They should also be well built so that the bees cannot crawl out when they are being transported.) Hang these small catcher boxes throughout the forest and they will have a greater chance of attracting swarming bees than 10 beehives located in one spot. Once the bees move into the catcher boxes you need to transfer them from where they are hanging to your apiary. Gently smoke the bees in your catcher boxes and move all 5 bars of the bees in one motion from your catcher box to your full size hive. You can move them all at once by using pressure from the palms of your hands to hold the bars together as if they were one. Take out 10 bars of your full size hive so that you have plenty of room to slowly lower them into their new home. Then shake the rest of the bees out of the catcher box into into the new hive before putting all bars back on your full size hive. 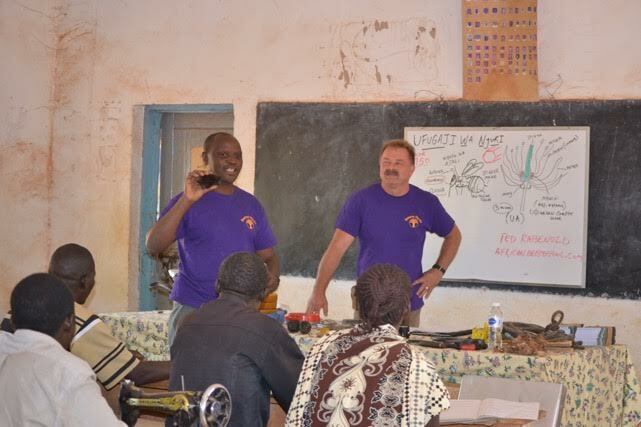 Due to the generosity of Clare Liptak, a friend of the Tanzanian Catholic Diocese from New Jersey, USA, we took 10 beehives and 12 beekeeper suits as well as other beekeeping materials including bolts of light canvas for making more suits, heavy duty zippers, and elastic. My wife Kim pictured here with some of the women who came for the training. There are more and more women interested in beekeeping as it is an excellent pastime to mix with their agricultural lifestyle. "The team” making wax starter strips from melted beeswax. The making of these starter strips is easily done by small-scale farmers with what they have on hand in their homes. Contrary to what one may think, beekeeping is not a complicated pastime that requires equipment from outside of their community. Ted showing how to affix bees wax starter strips to top bars. Firing up the smokers. Smoke impedes African bees' ability to communicate. Bees communicate through the use of pheromones, and dance. When African bees are disturbed they give off an alarm pheromone that causes the colony to attack any intruders. Smoke “masks" this pheromone making it possible for a beekeeper to harvest honey from his colonies. 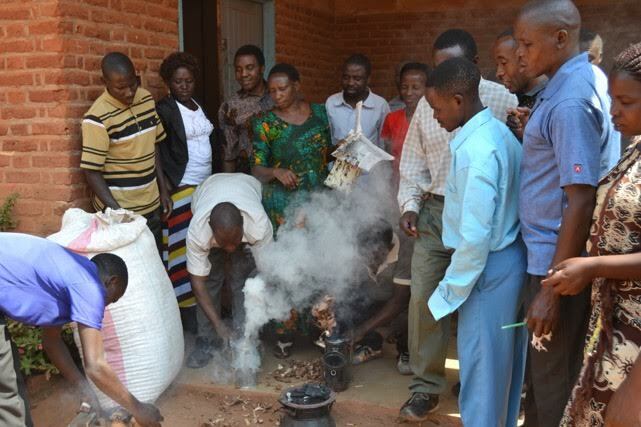 Smoke is the "Best Friend" of the African beekeeper. (A beekeeper will get used to how much smoke to use.) You should never smoke your bees so much that you hurt them with “hot smoke,” or the quality of honey being harvested. No one wants to buy smokey honey. 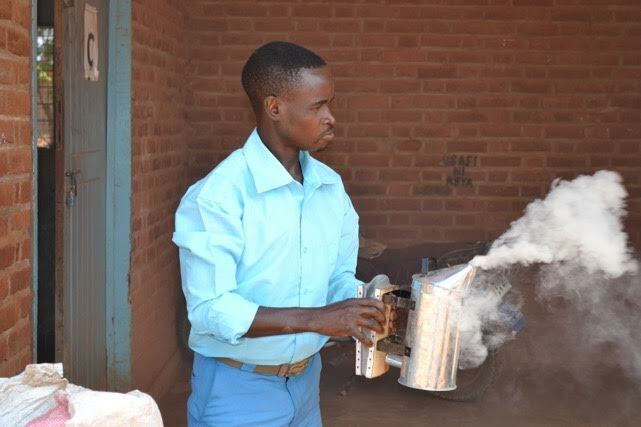 Suleman Henerko from Muhinda, getting dense, white, cool smoke from his smoker. This is what a beekeeper should strive for! Cutting a queen excluder "to size” from 4.5mm coffee wire. These queen excluders prevent the queen from laying eggs in the honey chamber of your beehive. Worker bees can cross through the wire but the bigger queen cannot. Since bees pupate, the brood chamber will have comb that has cocoons in it. They look like small cups if taken from the comb. It is undesirable to have these in your honey chamber. You do not need a queen excluder to get honey, but we now have them in 60 percent of our beehives. 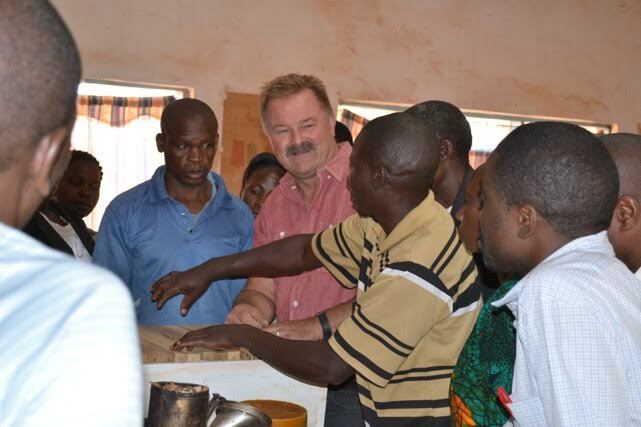 It has made harvesting easier and we have cleaner honey. Ted talking about the purpose of a queen excluder in the beehive. 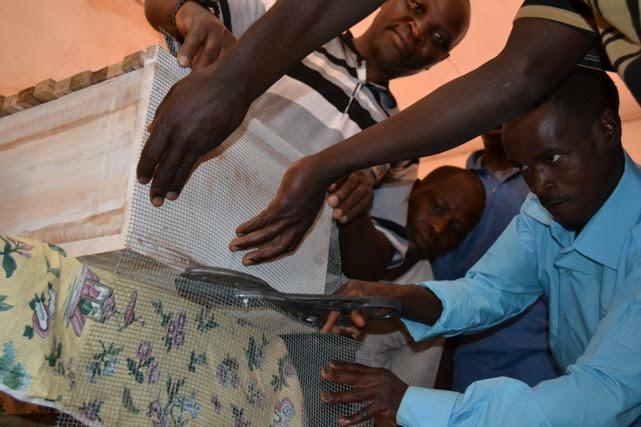 Using catcher boxes can help a African beekeepers get 100 percent occupancy in their hives. Catcher boxes are small 5-bar beehives for “catching" swarming bees. (The bars should be built the same size as the hives you are using.) They usually are inexpensive to build, costing between 10-15 dollars. There is more about them above. Jericho shows dark comb that the queen has been laying eggs in. This darker comb is located in the brood chamber and should be removed every few seasons so that they can build fresh comb in its place. 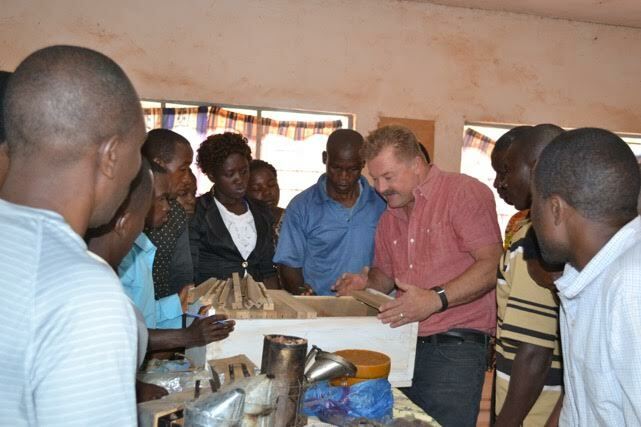 Ted explaining how a top bar beehive works. Only two of our trainees had ever seen one before. Most have used log hives at some time in the past. Log hives are good but they are what is called a "fixed comb" hive. That means that the combs are fixed to the hive by the bees themselves. The beekeeper cannot inspect them or harvest them individually. A top bar type bee hive provides the beekeeper with simple harvesting while not disturbing the queen and brood chamber as well as easy inspection. Trainees tasting two honeys from different sources. The lighter honey is from our May harvest and the darker one is from our November harvest. They are a different color because they are from the nectar of different flowers. Each flower imparts a unique aroma and flavor to honey through it’s volatile keytones. The darker a honey is the more minerals in it. Lighter honey sells faster than dark honey but dark honey is actually better for you if you consider the fact that it contains "beneficial minerals" in greater numbers!